At some point in the 350s A.D., an ecclesial council was convened at Gangra in Paphlagonia. The disciplinary canons that that council produced were the first to legislate on the nascent monastic enterprise and constitute a classic expression of the anxieties that that enterprise engendered among clerics. The council had been convened to examine the activities of the Eustathians, a monastic sect whose leader had been the erstwhile ascetic mentor of Basil of Caesarea. The charges leveled at the Eustathians at the council can be categorized to constitute three central purported abuses: first, the introduction of ascetic innovations against established practice; second, the disparagement or active dissolution of conventional social relations; and third, the marginalization or denigration of the hierarchical and sacramental structures of the Church. From our perspective (and perhaps that of the presiding clerics) it was this last accusation that was most salient: "If anyone teaches that the house of God and the liturgies performed there [tas en autōi sunaxeis]are to be despised," one canon proclaimed, "let him be anathema." Another legislated that "If anyone holds private assemblies outside the Church [para tēn ekklēsian idiai ekklēsiazoi] and in his hatred of the Church wishes to perform ecclesiastical acts [ta tēs ekklēsias etheloi prattein], when the priest in accordance with the bishop's will has refused permission, let him be anathema." This assumption of clerical privilege, and with it the repudiation of the structures of the Church, represented a fundamental challenge to episcopal notions of a Christianity formed within, and mediated by, the episcopate. The Gangran legislation sought to reinforce those same notions through subordinating monks to clerical authority and ritually orienting the entire Christian community around the assemblies of the Church. Despite sporadic legislative measures against monastic groups at both the local and imperial levels, the tensions between monks and clerics evident in the Gangran legislation nevertheless recurred throughout the late-antique Mediterranean. Clerics responded to such tensions through two principal (and quite discordant) means. The first such approach was to blur the intellectual and institutional boundaries between the two institutions, incorporating and redefining ascetic principles within the clerical ideal, and thus both clericizing monasticism and asceticizing the episcopate. The second approach, however, was not so much to blur as to strengthen the boundaries between the two vocations-not so much to bring ascetics within the world but rather to force them from it. As Daniel Caner has demonstrated in a seminal monograph on monasticism in the period up to 451, ecclesial authorities across the Mediterranean responded to the emergent monastic enterprise through attempting to impose paradigms of proper ascetic practice that were more congenial to clerical claims to leadership, and thus also economic support, within Christian communities. The monastic model enshrined in episcopal sermons, letters, and hagiographies emphasized that real monks were not those who wandered in cities and begged for alms-ascetic practices that in fact had a long and illustrious pedigree, in particular in Syria-but rather those who remained in the deserts and were self-sufficient, a model associated with Egypt and enshrined, of course, in Athanasius's Life of Antony. Practices through which ascetics encroached upon the social and economic jurisdictions of clerics were thus stigmatized as impious; and in successive controversies involving the conflict of monks and ecclesiasts, those who did not conform to these normative paradigms of monastic practice were branded as heretics and relegated from the religious mainstream. Caner regards the canonical legislation of the ecumenical Council of Chalcedon (451) as the apogee of this process, for here the ideological reorientation of monasticism anticipated at a more local level throughout previous decades was reinforced with universal episcopal and also imperial approval. Crucial in this regard is the council's famous Canon 4, which summarized the monastic abuses of which the assembled bishops disapproved-meddling in ecclesiastical and even civil affairs, wandering in cities, and even founding monasteries without clerical approval-and instead promoted a paradigm more congenial to the preservation of clerical privilege, in which the economic oversight of monastic communities was made an episcopal prerogative. The canon thus attempted to effect the full legal and economic subordination of monasticism to the clerical establishment, presenting the former, for the first time, as a lesser institution of the latter. Caner contends that the legislation of Chalcedon marked a significant watershed in relations between clerics and ascetics, not least because it implicated their economic interests. It is indeed true that the post-Chalcedonian period witnessed a distinct shift in monastic practice: in tune with episcopal demands, monks themselves began to promote models of monastic practice emphasizing that individual, withdrawn asceticism could be legitimized only by an extended period of sustained communal discipline; and in turn the power of individual ascetics went into decline, with spiritual authority increasingly the preserve of the leaders of sizable, largely coenobitic communities. If both these developments proved apposite to episcopal attempts to delimit ascetics' sphere of influence and operation, we must nevertheless be cautious not to overstate the extent of reconciliation between monastic and clerical imperatives. Significant tensions remained. For our purposes, the most important such tensions were those that we have seen within the canonical legislation of Gangra: that is, tensions between the competing demands of individual cultivation and submission to the spiritual improvement conferred through the rites and sacraments of the Church, in particular the eucharist. Although monks themselves in the post-Chalcedonian period began to promote forms of ascetic discipline that were more apposite to the vision of their clerical superiors, and although monastic and clerical institutions were indeed ever more implicated, a significant tension remained that the Chalcedonian legislators had, in effect, ignored: that is, the discordant imperatives of the ascetical and sacramental lives. Thus, despite a heightened degree of legal, economic, and institutional integration, the relative indifference to the structures of the Church witnessed within the Gangran legislation had still not been overcome. This chapter first outlines the striking eucharistic minimalism of the earliest ascetic biographies and anthropologies before tracing the attempts of various post-Chalcedonian commentators-and, in particular, anti-Chalcedonian commentators-to renegotiate that same tension. In part this renegotiation represented an extension of previous attempts to reconcile the monastic and clerical vocations, in particular in a context within which the boundaries between the two were becoming more porous. But it was also driven in the disintegration of dogmatic consensus accelerated through the Chalcedonian settlement, as anti-Chalcedonian communities began to elevate the eucharist as the central, aggregating icon of the orthodox faith and participation in its rites as the central expression of anti-Chalcedonian identity. This assertion of ritual integrity occurred at a time when sixth-century anti-Chalcedonian communities had become more alienated from the imperial Roman Church, and it was destined to be replicated within their seventh-century Chalcedonian equivalents, when foreign incursion and the perceived doctrinal deviation of Constantinople encouraged others to attempt a comparable, and indeed more comprehensive, renegotiation of the competing demands and theologies of the ascetical and ecclesial lives. It has sometimes been observed that the Eustathian practices condemned at Gangra intersect with a heretical sect described in the texts of later authors as Messalianism. It is clear that in its earliest stages the heretical profile of Messalianism gathered together the various deviant monastic practices that clerics despised-wandering in cities, begging, refusing to acknowledge clerics. Messalianism, however, had a further dimension that should be emphasized: that is, a perceived disengagement from the sacraments of the Church. According to Theodoret, one of the first to describe in detail the Messalian sect, their theological convictions rested on notions of inherent but displaceable sin and the possibility of restoration only through assiduous prayer. Thus, he claims, the Messalians saw no benefit in baptism; but also "declared, though not separating from ecclesiastical communion, that the divine food, about which Christ the master said, 'He who eats my flesh and drinks my blood shall live into eternity' [Joh. 6:54-58], neither benefits nor harms [oute oninanai oute lōbasthai]." Little wonder, then, that some commentators-both ancient and modern-have thought of the Eustathians as Messalians. For centuries it has been recognized that the various errors that Theodoret and others ascribe to the Messalians contain numerous correspondences with the corpus of Pseudo-Macarius, a late fourth-century Syrian theologian who is counted, alongside Evagrius Ponticus, as a progenitor of the late-antique mystical tradition. Comparison of the two corpora indicates that Pseudo-Macarius operated within an ascetic milieu similar to, but not interchangeable with, one that observers identified as Messalian. Thus he corrects the antisacramental leanings of the Messalian profile in dwelling upon the parallels between the ascetic life and the eucharistic rite, above all in Logos 52 of the so-called Collection I. It begins with the statement "The entire visible dispensation [oikonomia] of the Church came about for the sake of the living and intellectual essence of the rational soul, which is made in the image of God, and which is the living and true Church of God." Because "the entire Church that we now perceive is a shadow of the true, rational man within," God granted that the Spirit be present at the altar and in baptism, and the Savior that it preside over and participate in (epipolazein kai koinōnein) the Church's services (leitourgia), so as to act on "believing hearts." Here, "the dispensation and service of the sacraments of the Church [hē oikonomia kai diakonia tōn mustēriōn tēs ekklēsias]" have an emphatic spiritual effect, leading the faithful to the cultivation of the inner man represented in the structures of the Church. Pseudo-Macarius presents the Church's services as an illustration of the workings of the Spirit within the heart of the ascetic, and emphasizes in no uncertain terms the presence of the Spirit within the sacraments, perhaps as a direct defense against accusations of an antiecclesial Messalianism. Nevertheless, even in that defense, it is clear that his focus remains on the cultivation of the spiritual life and that, for the advanced ascetic, the outward structures of the Church are subordinated to the development of the inner man-in the words of Hans Urs von Balthasar, "at once something indispensable and something that must be outgrown." Flesh of Christ is practical virtues [Sarkes Christou praktikai aretai]; he who eats it shall become passionless [ho de esthiōn autas genēsetai apathēs]. Blood of Christ is contemplation of creation [haima Christou theōria tōn gegonotōn], and he who drinks it will thereby become wise [kai ho pinōn auto sophisthēsetai hup' autou]. Although in passages such as these Evagrius appears to point to the spiritual benefits conferred through communion, we should be cautious not to overstate the extent of Evagrius's eucharistic orientation. Contained within his quite vast corpus, there are but few comments on the eucharist; and even then, those comments are quite ambiguous as to the need for continuous submission to the rites of the Church. Evagrius's approach, like that of Pseudo-Macarius, is perhaps best appreciated as a eucharistic minimalism. It should be noted that this minimalism does not reflect a more general ambivalence toward the eucharist within Christian thought of the period, for contemporaneous with the ascetical speculations of Pseudo-Macarius and Evagrius there were various Christian intellectuals who devoted far greater attention to the eucharist and to the interpretation of its rites-Ambrose of Milan, Theodore of Mopsuestia, and Cyril of Jerusalem, to name but three. In the precise same period that the great ascetic pioneers developed their complex, introspective anthropologies, so too, therefore, was there a veritable explosion of contemplation on the nature of the eucharist, the significance of its rite, and its spiritual effect on the communicant. Within that tradition-which admits a remarkable degree of variation in terms of emphasis-one sometimes encounters a concern to elevate the need for moral pureness when receiving the sacrament (in particular in the homilies of John Chrysostom); but there was nevertheless little interest in accommodating the complex spiritual anthropologies developed in monastic circles. In turn, developed contemplation on the eucharistic rite remained the preserve of the episcopate. Throughout the period before Chalcedon, therefore-and thus coterminous with the continued separation of ecclesial and monastic institutions-these two great Christian discourses remained quite distinct. The effects of that continued intellectual separation can indeed be measured further, for in the hagiographies of the same period that describe anchorites or semianchorites, the ritual structures of the Church, and in particular the eucharist, are to a large extent absent. As noted above, Athanasius's Life of Antony has been seen as the classic expression of the episcopal vision for proper ascetic practice: withdrawn from the world, self-sufficient, and obedient to episcopal power. But as various scholars have observed, the same Life is also notable for its hero's total absence from the demands of the sacramental life. There were of course practical difficulties for those who engaged in more singular or more withdrawn forms of asceticism in ensuring regular access to the eucharist, so that its absence might be explained in an actual indifference to communion. But one must also nevertheless wonder if the emphasis upon monastic extrication from urban contexts within clerical hagiographies such as the Life had not also encouraged a relative ideological indifference to the regular submission of ascetics to the eucharist, which may also have demanded a regular infringement of those ascetics within the episcopal sphere. As we might expect, then, those monastic hagiographies that describe more settled or more concentrated communities are in general full of casual references to their ascetics' attendance of the regular service. But here again we encounter a striking indifference to the spiritualeffects of both the eucharist and its rites, so that in comparison to the vast amount of intellectual effort expended on material concerning the cultivation of the virtues and of mystical contemplation, speculation on the power of the eucharist is, in these texts, a marginal concern. Thus, for example, in Palladius's Lausiac History-a work that derives from the circle of Evagrius-we discover a specific condemnation of antisacramental attitudes in two consecutive tales in which the protagonists' descent into arrogance reaches its apogee with their refusal to attend communion and their dismissal of the eucharist as nothing. But the point of these stories seems not to be an emphasis upon the spiritual benefits to be conferred through the eucharist but rather a warning against spiritual arrogance, of which absence from the communal celebration is a classic manifestation. Here, then, we cannot explain indifference to the eucharist as a simple reflection of its actual absence from the ascetic life in practice (as we might for anchorites). Rather, it must reflect the same intellectual stance that we have witnessed within the earliest and most prominent ascetic theoreticians: an acknowledgment that the eucharist exists and cannot be dispensed with, but a simultaneous failure, nevertheless, to integrate regular communion within the spiritual vision. From a later perspective, when the eucharist begins to infringe upon hagiographic narratives more and more, one text nevertheless stands out: the late fourth-century History of the Monks in Egypt. Once again we discover a sanction to regular eucharistic participation, but here that same insistence is more balanced: on one side, with an emphasis on the spiritual benefits accrued through the host itself; and on the other, with an emphasis on the need for moral virtue on the part of the participant. Thus one tale, for example, refers to "a custom among the great [ascetics] not to provide food to the flesh before giving spiritual food [hē pneumatikē trophē] to the soul: that is, the communion of Christ [hē tou Christou koinōnia]"; while in another an eminent ascetic avers that "Monks, if possible, must each day partake of the mysteries of Christ [tōn mustēriōn tou Christou koinōnein]. For he who removes himself from the mysteries removes himself from God. But he who does this frequently receives the Savior frequently. For the voice of the Savior proclaims, 'He who eats my flesh and drinks my blood remains in me, and I in him' [Joh. 6:56]. It is therefore profitable for monks constantly to remember the Savior's passion and always to be worthy to receive the heavenly mysteries [pros tēn tōn ouraniōn mustēriōn hupodochēn], since thus we also receive forgiveness from sin." Here, therefore, not only is the eucharist emphatically present, and its spiritual efficacy emphatically acknowledged, but its spiritual effect is also made dependent upon the moral attainment of the participant. Rather than a prevailing indifference to eucharistic communion, therefore, the History of the Monks in Egypt-as well as the associated vignettes within the Lausiac History-suggests a not insignificant debate on the spiritual status of eucharistic communion amid monastic communities, mirroring the theoreticians' attempts to counter the more extreme antisacramentalist tendencies of (at least some of) their contemporaries. Although there is no developed attempt, in this earlier period, to integrate the dominant focus upon ascetic virtue and contemplation within a wider ecclesial framework, the same texts nevertheless manifest evident anxieties over ascetics' relation to the eucharist, anxieties that subsequent generations were to explore in far greater depth. From around the Council of Chalcedon in 451, the relative hagiographic indifference to the eucharist and its rites begins to change. In part, this change must be considered as the product of real shifts on the ground: that is, on the one hand, the extension of the aforementioned phenomenon of monastic ordination, which blurred the lines between the monastic and clerical vocations; and, on the other, the increasing sacramentalization and liturgification of monastic practice itself, as that practice came to be reframed within an ever-growing set of prescribed rituals. In certain cases, therefore, we witness a simple continuation of the earlier inclusion within some hagiographies of casual references to monks' attendance of the eucharistic rite; but in others, one detects a definite and deliberateemphasis upon those same rituals as a prerequisite of legitimate asceticism: that is, nothing less than an attempt to uphold a new model of monasticism itself. What we are interested in here, therefore, is not the disinterment of actual monastic practice from the scattered references contained within hagiographies so much as the delineation of the ideological model of that practice that such hagiographies seek to represent. Post-Chalcedonian commentators offered various such models, but all shared a fundamental concern with the competing imperatives of individual and institutional ascetic endeavor. At stake was the status of the contemplative tradition represented in the corpora of Evagrius and of Pseudo-Macarius, and here we will examine two responses to it-clerical and sacramentalized on the one hand; monastic and desacramentalized on the other. The latter is contained within the collected Lives of the sixth-century Palestinian hagiographer Cyril of Scythopolis, in which we encounter an ascetic quite different from those exemplified in the texts of the pioneering generations, one in whom individual endeavor is subordinated to the demands of a wider institutional framework-monastic, ecclesial, and imperial. Where the most prominent monastic figures of the pre-Chalcedonian generation often found themselves in conflict with the secular authorities, Cyril's conception of the ascetic's place within the world forms a notable complement to that contained within the legislation of the emperor Justinian. Bernard Flusin has demonstrated how the stated doctrine of Cyril's heroes retrojects and repeats verbatim the official doctrinal position of the Justinianic state; but these parallels in fact extend even further, to their respective political philosophies of the ascetic life. Justinian's attitude to monasticism is summed up in his Novel 133 (published in 539), in which he proclaims the proper function of monasticism as the petitioning of God for the health of the state. It is thus of great interest to note an anecdote contained within Cyril's Life of Sabas in which the eponymous hero encounters Justinian himself and in that encounter embodies the monastic ideal expressed within the emperor's Novels. The narrative describes how Sabas once traveled to Constantinople on behalf of the patriarch in order to beg for a remission of taxes following a Samaritan revolt. "While our God-protected emperor was engaged in these matters with Tribonian the quaestor in the place called Magnaura," Cyril reports, "the blessed Sabas separated himself off a little and began to recite to himself the Davidic psalms, completing the divine office of the third hour. One of his disciples-called Jeremiah, a deacon of the Great Laura-approached him and said, 'Honorable Father, when the emperor is showing such enthusiasm in fulfilling your requests, why do you yourself stand apart?' And the elder said to him, 'Those men, my child, do their work; let us also do ours [ekeinoi, teknon, to idion poiousin; poiēsōmen kai hēmeis to hēmeteron].'" This book focuses on the attempts of three ascetics—John Moschus, Sophronius of Jerusalem, and Maximus Confessor—to determine the Church’s power and place during a period of profound crisis, as the eastern Roman empire suffered serious reversals in the face of Persian and then Islamic expansion. By asserting visions which reconciled long-standing intellectual tensions between asceticism and Church, these authors established the framework for their subsequent emergence as Constantinople's most vociferous religious critics, their alliance with the Roman popes, and their radical rejection of imperial interference in matters of the faith. Situated within the broader religious currents of the fourth to seventh centuries, this book throws new light on the nature not only of the holy man in late antiquity, but also of the Byzantine Orthodoxy that would emerge in the Middle Ages, and which is still central to the churches of Greece and Eastern Europe. Phil Booth is Leventis Lecturer in Eastern Christianity at Oxford University. "Phil Booth has produced a magisterial book focusing on three crucial figures from Palestine who wrote in Greek in the early seventh century. Two of them played a central role in the huge issues of the period that saw the first Arab conquests; all three saw their world as that of the entire Mediterranean. Booth's demonstration of how sacramental spirituality, theology and politics were interlinked is a major achievement and a real breakthrough. The seventh century will never seem the same again." 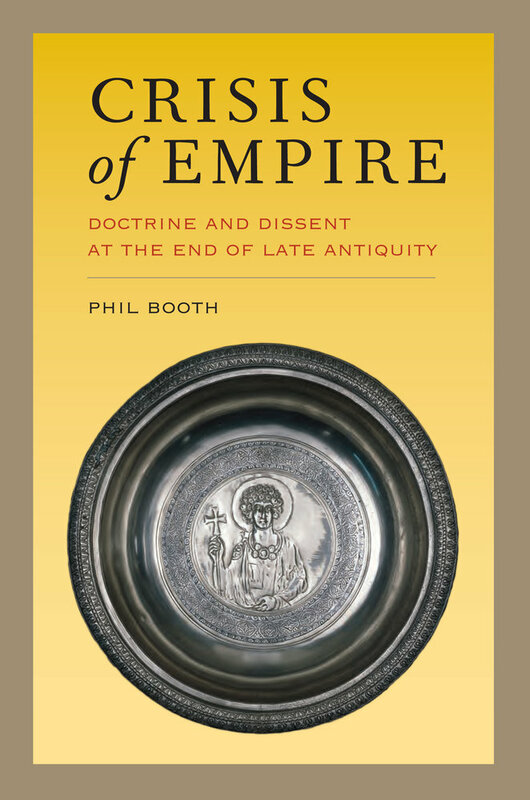 "Crisis of Empire is a fresh, provocative, and carefully revisionist interpretation of the extraordinary “monastic dissent” that challenged the imperial order in the turbulent seventh century in Byzantium. Booth’s narrative brilliantly captures the drama of the alliances forged between monks, ecclesiastics, and provincial imperial officials in countering the christological positions assumed by emperors and Patriarchs of Constantinople. This monograph will be of tremendous interest to Byzantinists and patristics scholars alike." "Booth’s book showcases the political and religious roles of John Moschus, Sophronius of Jerusalem, and Maximus the Confessor, who have never before been treated together in this way. A compelling case is made for the position of the ascetic within the church, rather than on its fringes, against the continuous backdrop of the declining fortunes of the Christian Roman empire during the Persian and Arab advances. This book is well-written, well-argued, and above all readable." "Previous works on this crucial period of Byzantine history have tended to focus on material, legal or military history, at the expense of the important role of theology in the events that unfolded. Booth’s innovation is to make the sacramental understanding of the eucharist central to the political involvement of Maximus, Sophronius, and Moschus, whose collaboration is traced here for the first time."